Day #1: NPO (no food or water) for 24 hrs. Day #2: Mix 3 parts cooked white rice with 1 part low fat cottage cheese. Give in very small portions at least 5-6 (even 10-12) times during the day. You may begin allowing your pet small amounts of water on this day. Allow your pet only 3-4 laps of water once per hour then remove the water bowl from your pet's reach. Prescription Science Diet I/D can be used instead of the rice & cottage cheese. ﻿Day #3: Continue the I/D or the rice &amp; cottage cheese diet in larger portions if possible. Allow your pet only 5-6 laps of water once per hour then remove the water bowl from your pet's reach. Day #4: Slowly begin adding normal dog food in small portions (mixed with the bland diet in decreasing proportions) during this 24 hr. period. 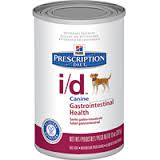 Day #5: By the end of day #5, the diet should be consisting of almost 100% regular dog food. You may leave your water bowl down if your pet has no signs of illness.